There is no better way to celebrate our arrival at blog number 50, than to recognize a new exhibit featuring co-founder of artbouillon.com, Rachel Bernstein. Rachel's work has attacked the enormous front window of L.A.'s excellent Craft and Folk Art Museum (just a block down form LACMA on Wilshire). 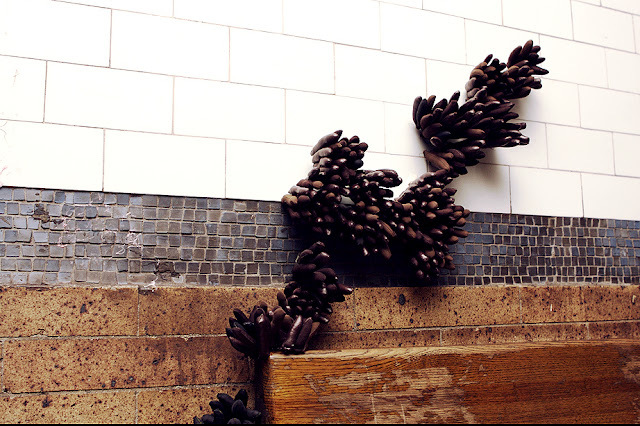 She has created an infestation of finger-like protuberances that spread like an invasive growth on the building's exterior and interior. Rachel's installation is part on an exhibition cleverly called Social Fabric, curated by Berkeley's Anurahda Vikram. It features a group of artists who are using fabric to create fine art, with a social edge. Use of fabric in art is itself a politically message, since fabric has been treated as a medium for women, hence not worthy of fine art. 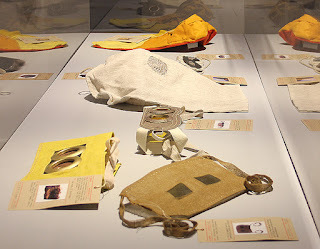 The work display represents the fiberart revolution, which seeks to correct that gendered ranking, by bringing techniques such as sewing, needlepoint, and knitting into legitimacy. Some of the work on display is overtly political. Consider Allison Smith's marvelous gas masks. Using old photos from military museums, Smith recreates fabric masks of the kind that were once used in battle during the brutal first half of the 20th century. The handmade fabric designs have a quaint charm that hangs in grim tension with the knowledge that the originals would have be worn under conditions too horrendous to imagine. On display in the show are some of the actual gas masks that Smith has created as well as a photo series of iconic images, which turn these tools of war into fashion garments. Stephanie Syjuco's work is another case in point. With the help of craftspeople around the world, she makes crochet knock-offs of designed handbags. The bags serve as a reminder of the hegemony of big brands, which have come to epitomize status and the global spread of capitalism. Syjuco's practice also draws attention to the fact that makers of designer products often use underpaid workers in developing countries. By participating in the production of the knockoffs, foreign workers can reclaim their dignity while creatively condemning exploitation. Another highlight of the show is work by the Combat Paper Project. Participants in the project are veterans, who take their military uniforms and convert them into pulp, which they they make into paper and use for making art. Rachel's work is political in a different way. She is interested in what may be the defining obsession of our species: the quest to control nature. Invasive growths represent the uncontrollable. Her fabric fungi invade interior space, bringing the outside in, as it were, asserting the indomitability of nature. Over the duration of the exhibition, she will build on her window installation, as if it were growing, and encroaching inexorably on the normally pristine museum. Rachel's work also challenges the boundary between the beautiful and the grotesque. Invasive growths are usually repellent, but Rachel's rendition has poetic allure. She has another installation in the exhibition gallery and some photos of her fungi in various urban and wild settings, including a New York subway station. In the latter context, they represent not just the encroachment of nature, but the encroachment of art. Metaphorically, perhaps, art too is an alluring and uncontrollable fungus that crops up in surprising ways, violating expectations, and posing positive challenges to prevailing norms.